“I think it’s a fun picture,” said Alfred Hitchcock of his film Psycho (#35), which is how I feel about the release of UK-based film journal Sight & Sounds decennial list of the “Greatest Films of All Time.” Some people are furious about it. Some people are dismissing it. I fall slightly in the middle. 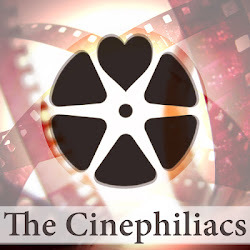 Oh yes this or that or whichever isn’t on the list, but it’s a list, and like Hitchcock thought of his film, it’s fun, and it’ll be fun to see a new generation of cinephiles discover Vertigo (and of course write think pieces about how it’s overrated). Sight & Sound “forgot” to mail me a ballot this year, though I’ve written sketches in the past of how my list may parse, and don’t see why I should just print that out again, because honestly there’s too much I still haven’t seen (six films from the 2012 list – Shoah , Journey to Italy, Panther Panchali, Gertrud, Historie(s) Du Cinema, and Ugestsu Monogatari), and what’s the point of “another” list? That list is great, and everyone should see those films. I don’t know if my cinephiliac moments follow exactly Shambu’s reasoning – some of them after all are quite big moments in the films they came from, and certainly they aren’t “accidentals” as he states it. 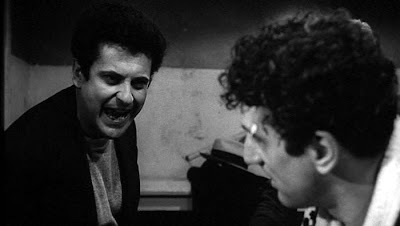 But these moments unlock my deepest moments of cinephilia, the point in which I realize why I keep going to the movies. I started at five, and then it soon became twenty five, and then narrowed it down to eleven. They are presented in no order. Add your own in the comments, or link me to your piece and I’ll include a link here. The use of animal noises in Scorsese’s Raging Bull is a great technical and artistic statement in the brutal, boxing film, even if it is foraging an obvious metaphor. But late in the film, Jake suspects his brother Joey of cheating. After pummeling his wife to declare she had an affair with Joey (though most likely not true), Jake storms over to Joey’s house, and proceeds to beat the crap out of him. But what struck me the last time I saw it was that we hear those same sounds just right before Jake throws the first punch. It’s the most essential moment in which we realize, this man cannot see the difference between the ring and outside it. In Kurosawa’s High and Low, the villain must test to see if his evil plan will work by visiting an addict’s den and testing a special serum of heroin on an unsuspecting person to see if it will kill. The police are watching him, but need him to commit the murder in order to arrest him. He chooses a woman, she slowly collapses to the floor, his eyes hidden by dark sunglasses. When he leaves, the police rush up the stairs to see the body. Kurosawa tracks their feet up the stairs, landing on the collapsed body on the floor, already dead. In a film about the duality of man as well as spatial relation, here is a shot of us rising to evil. The evil here is threefold: the criminal, the addict, and the police who it allowed it to happen. And in this shot, going from the bottom to the top, we see it all. While Sight & Sound may disqualify it, it’s almost impossible for me to see The Godfather films as separate. 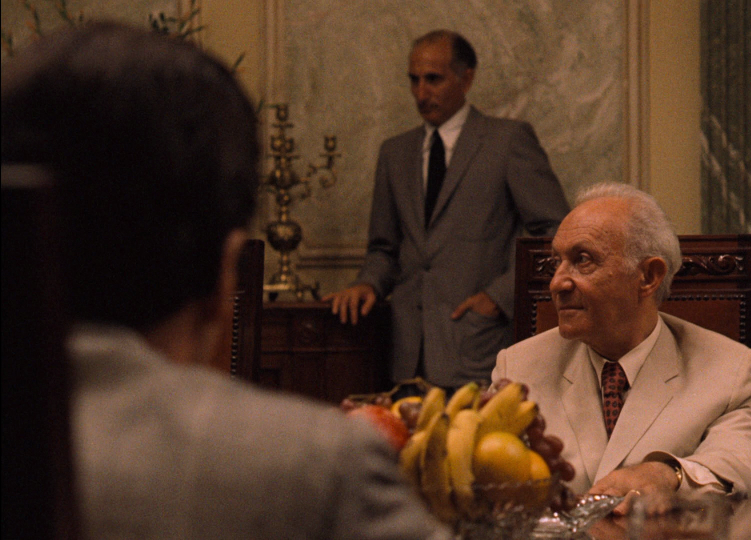 Both are about America, but in many ways The Godfather is a closed off world (as the final shot would suggest). The families live within their own circuit. But that’s not the case in The Godfather: Part II. Part II is truly about the rise of America through capitalism. We see it in Vito’s immigrant story and in Michael’s expansion of his business. But there’s one moment for me that defines this film. Michael has come to Cuba for a possible investment. At a long table, a business man introduces us to the five families: General Fruit Company, United Telephone and Telegraph Company, Pan American Mining Company…wait what? Coppola beautifully mimics his own work from the first film with the introduction of the five families, and at this point we realize what America is. In the old country, it is family. In America, it is business. It’s almost impossible to describe Close-Up, the cryptic faux-documentary from Iranian director Abbas Kiarostami. It’s an emotional story, but one that messes with every notion of documentary cinema, and really cinema I ever see. But there’s a moment, and it’s something I can’t explain, but it explains cinema to me. The film begins as we travel with the police in a car, and it feels like a documentary. Heck, the car even stops to ask for directions, and a man tries to sell the cops a live chicken. But once we get to the house where the culprit will be caught, the camera stays outside. The driver kicks a can down the road…and down it goes. And we follow it, for almost a minute, in an unbroken take. If Close-Up was a standard, Hollywood film, we would watch the police arrest the culprit. If it was an independent film, we would find out very humanizing details about the driver. 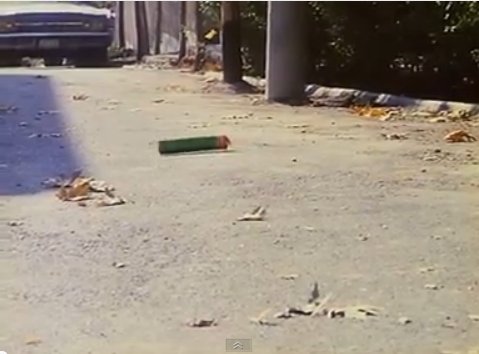 But in Kiarostami’s world, we follow a can. This shot for me will always be cinema’s greatest enigma. If Sweet Smell of Success isn’t the greatest of all noir, then I don’t know what is. Many films live in the same stench of the gutter, but few films make you want to join their racks and live down there, just to get a taste of how living bad can be so good. The film’s narrative is a power struggle between big shot gossip columnist JJ Hunsecker and innocent little Suzie, who just wants to marry her jazz player boyfriend. But things don’t work out, thanks to JJ and Sidney Falco. But somehow, the two decide to ally themselves, and get Falco. And then comes the devastating shot: A POV from Falco, starring at both JJ and Suzie, each with the same dead look in their eyes. “You’re growing up,” JJ tells his sister. She certainly has. I’m working on something longer on Pulp Fiction that’s in a bit of a state of limbo at the moment, but something always nags me about Pulp Fiction: we always talk about how “cool” the movie is, but we never define it. Why? Well, because the only reason Pulp Fiction is cool is that the film tells us they are cool, and then Tarantino challenges us on it. I always come back into the film to the character of Jodie, Lance’s wife, who gives that epic monologue about her 18 piercings. She is the definition of piercing…until she sees the ultimate piercing – a needle (just like she always uses! ), right through the heart of Mia Wallace. When Tarantino does his Good, Bad, Ugly style lead up to this epic moment, it is her face that he ends up on right before. The ecstasy on her face is undeniable. She is becoming witness to what cool truly is. 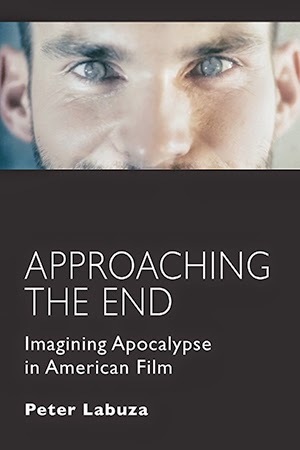 Late in the “no longer greatest film of all time but at least it’s number two,” Jebediah, Charles’s best friend who had a falling out, recalls the last moment he saw Kane, pounding away at a typewriter, “correcting” his review of the opera he has produced. 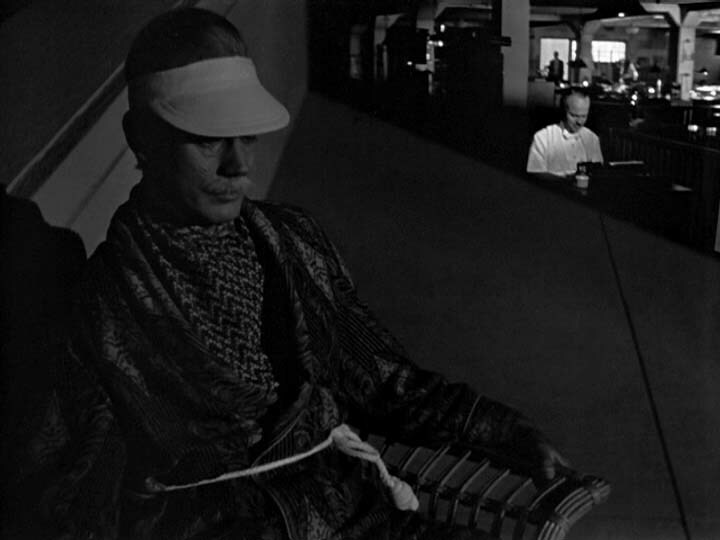 And then, half the screen cross dissolves to the older Jebediah, now blind, is sitting and telling his story. We watch the half the screen—that last memory of Charles—fades slowly into darkness. And that is life itself. Our memories, our final image of those we both love and hate, fading into darkness. 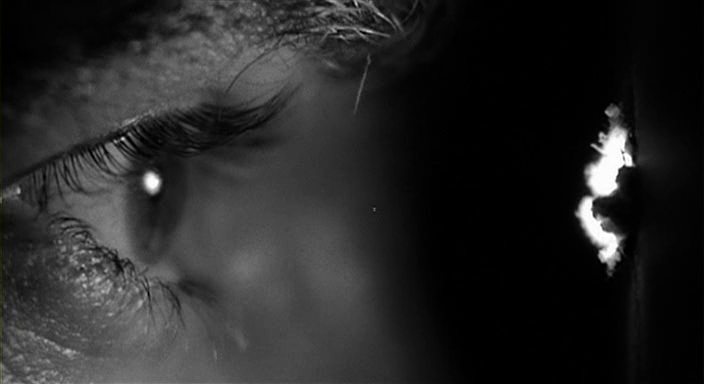 A Slate piece this week called Citizen Kane “emotionally hollow,” but why am I crying every time I see that shot? In this shot, Welles, even as a young man, could explain all of our fears of regret and old age. Our last image of those we love, fading into darkness. Transcendence of a Star – Sunset Blvd. 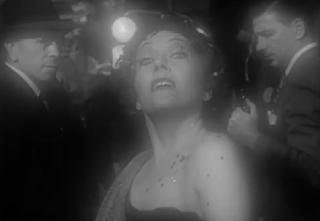 “All right Mr. DeMille, I’m ready for my close-up.” announces Norma Desmond, now lost to her own mind in Sunset Blvd. As Billy Wilder portrays her, she is now lost into the movies forever, she has become her star persona, and reality has drained away. She approaches the camera, closer and closer, and then the screen begins to transcend with her. It dissolves, as if her star persona, so intangible to us mere mortals, melts the camera with awe-striking power. Is this her dying moment? Norma Desmond is no longer among the living. And like the final image of Bresson’s Diary of a Country Priest, we can no longer privy her through our mere mortal eyes, and neither can the camera. Since its spiritual birth, art has accomplished one great thing – make us feel through something artificial. Love, hate, nostalgia, fear, happiness – this is what art does to us. And thus what makes Chantel Akerman’s Jeanne Dielman, 23 Quai du Commerce, 1080 Bruxelles such an amazing masterpiece is that it might be the most frightening horror movie ever made, and I can pinpoint the moment that horror comes over. For three and a half hours, we watch the mundane life of our mundane heroine as she cleans and cooks around her house. But her routine is slowly unraveling. Somewhere during the second hour, she suspects something is terribly wrong with her coffee. She attempts to fix it in silence, but nothing seems to work. During this process, she almost knocks over her milk. And I screamed. I screamed when I saw this moment because I was in sheer terror of what would happen if that milk bottle fell. And then I realized how this film, by taking its time, setting up its rhythms and tropes, had sucked me right into the cinema. I felt horror for this woman over a milk bottle that didn’t even spill. Welles said there were three great masters of cinema, “John Ford, John Ford, and John Ford,” and there are many days where I think, yes that’s pretty much right. Especially whenever I watch this scene. Ford never needed dialogue – he told his stories through compositions. 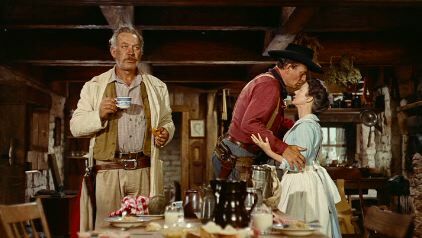 And does any moment define the tenderness of forbidden love than the moment in The Searchers as Martha hands Ethan his coat, and he plants a tender kiss on her forehead? There is Clayton on the opposite side of the frame, eyes averted, doing all that is possible not to see the truth. No words are spoken, but none are needed. It’s a romance that existed once and never again. We can feel everything in this moment, it is the underlying motivation that will drive the rest of the narrative, but it is never spoken. Cinema is an infection of the eye. Once you gaze upon it, you can never look away. It warps how you see the world. It changes your vision. It’s a powerful gaze. A gaze of transcendence. And perhaps no greater moment comes in Saul Bass’s credit sequence for Hitchcock’s Vertigo, the now greatest film of all time. As the title Vertigo comes up, we stare into a woman’s eye. The artificial red glaze of the screen makes my blood run, as if the passion of cinema has infected how I can see into this eye. 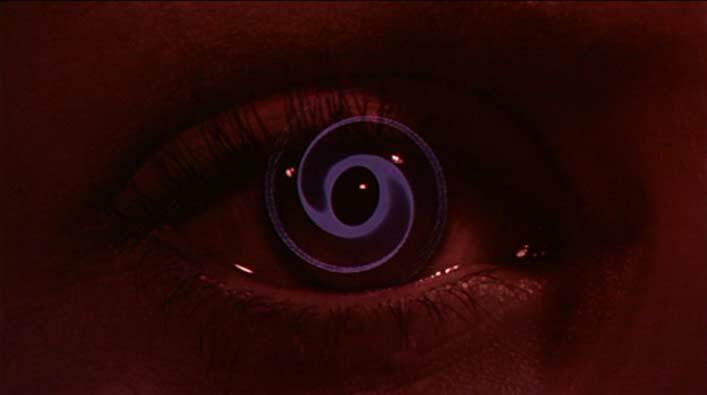 And from there, a purple spiral emerges out of the pupil. Larger and larger it grows. I can’t look away. I won’t look away. What is beyond that spiral? What happens if I stare too deep? And then it simply consumes you. You become lost in the spirals as they warp around the screen. 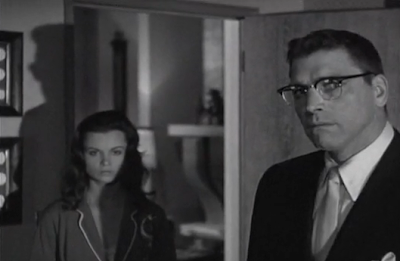 And as Bernard Hermann’s score suggests, it is a beautiful moment. It is cinema. Lost within your own eyes. Unable to explain what this mechanical art form has created. It has become part of your psyche, your existence. And you can never let that go. "There is a fantastic sequence in The Searchers involving a brash frontier character played by Ward Bond. Bond is drinking some coffee in a standing-up position before going out to hunt some Comanches. He glances toward one of the bedrooms, and notices the woman of the house tenderly caressing the Army uniform of her husband’s brother. Ford cuts back to a full-faced shot of Bond drinking his coffee, his eyes tactfully averted from the intimate scene he has witnessed. Nothing on earth would ever force this man to reveal what he had seen. There is a deep, subtle chivalry at work here, and in most of Ford’s films, but its never obtrusive enough to interfere with the flow of the narrative. The delicacy of emotion expressed here in three quick shots, perfectly cut, framed and distanced, would completely escape the dulled perception of our more literary-minded critics even if they designed to consider a despised genre like the Western. The economy of expression that Ford has achieved in fifty years of film-making constitutes the beauty of his style. If it had taken any longer than three shots and a few seconds to establish this insight into the Bond character, the point would not be worth making. Ford would be false to the manners of a time and a place bounded by the rigorous necessity of survival."